Looking for land, farmers from Utrecht make their way to the marshy area known as Aemstelle. By digging drainage canals, the swampy land is slowly reclaimed. The farmers and fishermen, who make their homes on both banks of the Amstel River, build their houses on mounds to stay above the water. 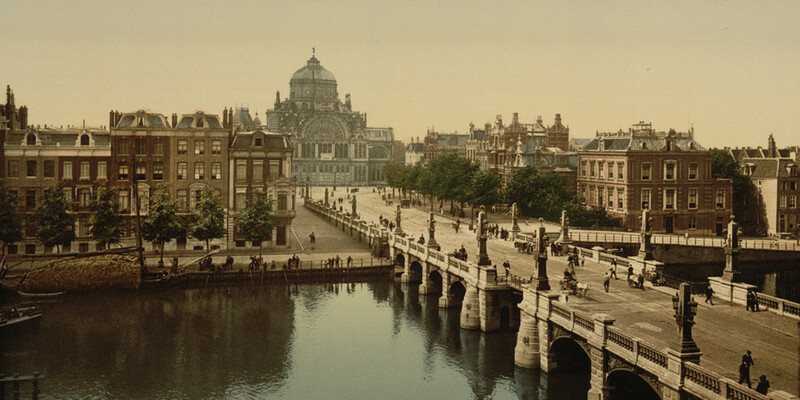 Around 1250, a dam was constructed on the Amstel, from which Amsterdam derived its name. The dam, which was financed by the Lords of Amstel, connected the two banks of the Amstel River. On this dam, which was slowly expanded over time, the centre of what would later become Amsterdam arose. The Toll Privilege, which was written in 1275 by Floris V in Leiden, is the oldest document in which Amsterdam is mentioned. The document was written after Floris' soldiers wreaked havoc in the small village. By way of compensation, the inhabitants were granted the right to move goods within the county of Holland without paying fees. Around 1400, Amsterdam had grown into a city of about 3000 inhabitants. Since all of the houses were made of wood and built right next to one another, there was a constant threat of fire. In 1452 a great fire broke out that destroyed two thirds of the city. As a consequence, it was decided that houses should be built of stone. However, these 'heavy' houses sank into the boggy soil. To prevent this, long wooden piles were subsequently used as foundations. Amsterdam was late in getting its own city walls. Prior to this the city’s residents had to make do with the occasional defensive moat or earthen wall. The municipality eventually decided to build walls for fear of looters from Gelderland and Utrecht. Apart from the extra security provided by the wall, it also showed outsiders that Amsterdam was an independent community with its own governance. After the beginning of the Dutch revolt, Amsterdam remained loyal to the Spanish king. However, Protestant rebels led by William of Orange ruled the area surrounding Catholic Amsterdam. On 26 May 1578, a shift took place that forced the Catholic city council and the Catholic clergy to leave the city. Amsterdam joined the revolt and grew into an economic superpower partly due to the arrival of merchants from the southern Netherlands. The Verenigde Oost-Indische Compagnie (VOC or United East Indian Company) is founded. Amsterdam is the main partner in this multinational commercial enterprise. For a long time the VOC controls the lucrative trade between Asia and Europe. In the 17th and 18th centuries it is the largest trading company in the world. In Asia the VOC acts as a representative of the State-General. This first multinational is empowered to create local governments in its colonies, to administer justice, mint coins and to negotiate treaties with foreign powers. The strong growth of both Amsterdam’s economy and its mushrooming population causes overcrowding and poor sanitation. In 1613 the municipality decides to initiate the first major expansion of the city. A series of canals were constructed to supply badly needed housing, docks and warehouses. The world famous canals like Herengracht, Prinsengracht, and Keizersgracht are dug around the old medieval city in semicircles. The band of canals has been on the UNESCO list world heritage list since 2010. Reformed Protestantism becomes the most important religion in the Dutch Republic during the 17th-century Golden Age. Catholic churches were converted, but new ones were needed for the growing numbers of Protestants. The most prominent of these new houses of worship is the Westerkerk. When it was completed in 1631 it was the largest reformed church in the world and the tallest building in the city at nearly 84m. The old Gothic city hall had become too small for the largest centre of trade in the world. The city council commissioned Jacob van Campen to design a new city hall, which would reflect Amsterdam’s expanded power and glory. In 1648 construction began. To guarantee a stable foundation, no less than 13,659 piles were driven into the ground. Many artists were involved in decorating the classicist building, which was completed in 1665. With help from the French Revolutionary Army, the Batavian Republic was proclaimed in 1795, but Napoleon Bonaparte put an end to the republic in 1806 and named his brother Louis Napoleon king of Holland. The king, who initially resided in Utrecht, makes Amsterdam the capital and centre of the government. King Louis Napoleon claims the city hall as his Palace on the Dam. Even in slightly backward Amsterdam, signs of modernity slowly seeped in. The new symbol of the spirit of the age – a building for everyone – was erected on Frederiksplein, in large part due to the efforts of Jewish physician Samuel Sarphati. However, the building, which was inspired by the Crystal Palace in London, burnt down in 1929. In 1928, Amsterdam secures the honour of hosting the Olympic Games. 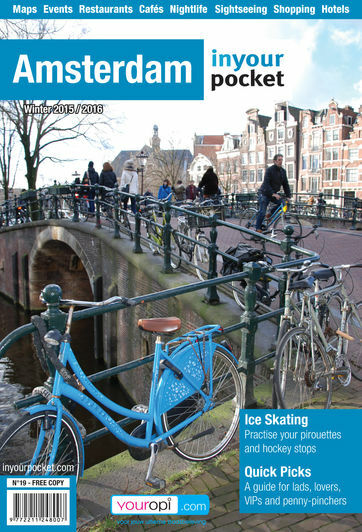 For some time Amsterdam becomes the centre of the international world of sports. It was a huge success in the Netherlands generating great interest from the general public and great accomplishments by local athletes. The refurbished Olympic Stadium is still the proud symbol of this golden era. After mergers with other municipalities and a wide-scale modernisation of infrastructure, a new urban plan was needed to ensure Amsterdam would continue to function and grow. This led to the General Expansion Plan by Cornelis van Eesteren. He envisioned a new division of the city and took into account population growth up to the year 2000. The plan becomes a model for modern city development and strengthened Amsterdam's reputation as a forward thinking city with important architecture. In the 1930s the economic crisis caused unprecedented unemployment in Amsterdam. This, in combination with harsh government austerity measures caused a tense atmosphere in the city. Eventually, this combustible cocktail was ignited and desperate labourers took to the streets in protest, which quickly led to fights with the police. The situation escalated and the army was brought in to restore order. During the five-day revolt, five people were killed. Soon after Nazi Germany invaded the Netherlands, Jews became the victims of the occupiers. Many Jews were arrested and disappeared into concentration camps. A general strike was organised in Amsterdam on 25 February 1941 in protest. The February Strike was put down violently and despite this outcry, most Jews in Amsterdam – including Anne Frank – did not survive the war. In the harsh winter of 1945 the food supply to Amsterdam was nearly completely cut off for fear of air raids or commandeering by the German occupying forces. By the end of September, the shop shelves were already empty and prices on the black market skyrocketed. The lack of food, combined with the intense cold and lack of fuel, led to desperate attempts to get supplies from the countryside – so called hunger journeys – as well as mass mortality among Amsterdam’s residents. Johan Cruijff makes his début on the first team of Ajax. With his club he wins the European Cup final against the Greek side Panathinaikos in 1971. After his transfer to FC Barcelona Cruijff still celebrates major successes, and to the Catalan people he is known as El Salvador. In 1974 the footballer, number 14, manages to reach the World Cup final, together with the Dutch team. After a career as a football player and trainer 'skinny Jopie' is named European Football Player of the 20th century. The Provos movement started in 1965. These young anarchists protested in playful ways against what they considered to be narrow-minded bourgeois society. These provocateurs focused on issues like the environment, women's emancipation, changes in the arts and free love. They frequently gathered around the statue of 'Het Lieverdje' (the Sweetheart). On 13 May 1967, the movement claimed victory and disbanded. Its goal had been achieved: the authorities were in complete disarray. In the weeks leading up to the crowning of Princess Beatrix, a variety of conflicts erupted between squatters in Amsterdam and the police and tensions kept rising. The situation exploded on the day of the coronation, which resulted in one of the worst riots in Dutch history. Squatters protested against a lack of housing, unemployment and the royal coronation and got into fights with the police. Gay Pride is the highlight of the year for homosexuals in Amsterdam. During the first weekend of August, a party is held in the inner city, where participants show pride in their sexual orientation. The highlight of the festivities is the parade on the canals, also called Canal Pride. There are also many street parties. The Zuidas (South Axis) is Amsterdam’s financial and educational centre located in the south of the city. Although the 670-acre area is still being developed, 400 companies and institutions have already settled here including the head offices of various multinationals and a university. Housing, shops, schools, theatres and museums will also become an integral part of Zuidas, which has placed an emphasis on sustainability and accessibility for all.